Senior haredi lawmaker hits Netanyahu for intervening in flap regarding scheduled Shabbat construction on Tel Aviv's Yehudit Bridge. 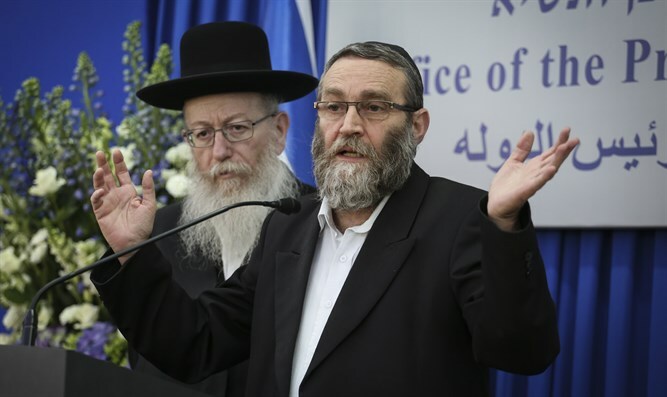 'Degel Hatorah' faction leader and MK Moshe Gafni offered Prime Minister Netanyahu a stinging rebuke for intervening in a decision to stop Shabbat construction on Tel Aviv's Yehudit Bridge, Kikar Hashabbat reported. Netanyahu hinted that he wanted the maintenance to take place on Shabbat, telling reporters before taking off for Lithuania on Thursday that "I don’t think it is reasonable to close a main transportation artery like the Ayalon in the middle of the week". Speaking at a conference at Bnei Brak's Ma'ayanai Hayeshua hospital, Gafni accused Netanyahu of being "disconnected" for not knowing that the Ayalon highway is also closed for other occasions, such as the gay pride parade. "We know that the Ayalon Highway closes," said Gafni. "I am also telling the prime minister that before he got on the plane, he said that it is impossible to close the Ayalon Highway, He is apparently not so aware of what is happening in the country." "The Ayalon highways were closed for the parade, the Ayalon highways closed for a sports competition. N only the Ayalon highways, other main roads, and no one said a word," added Gafni. Transportation Minister Yisrael Katz had announced on Wednesday that the construction work on the Yehudit Bridge, which will connect Yigal Alon Street and the Montefiore neighborhood, would be postponed by half a year. The construction had originally been scheduled to take place on Shabbat in order to shut down the central Ayalon Highway on a day when traffic is relatively light. Katz had reversed the decision following protests by the haredi MKs.